Nothing beats bacon and eggs. 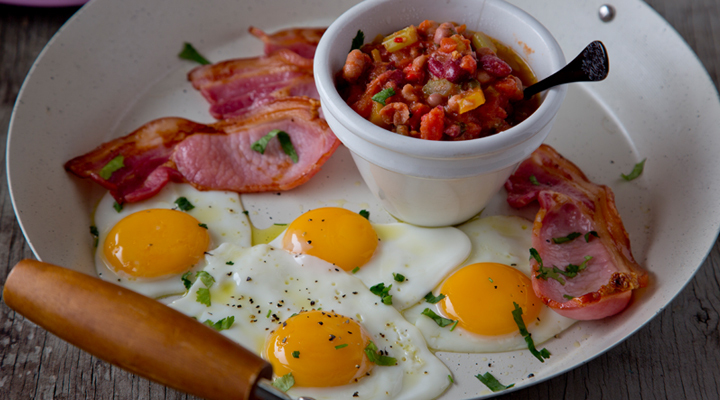 Serving it with a chunky salsa is a great way to kick off the day. 1. Cook the bacon under a hot grill until it’s crisp, turning it every few minutes so it cooks evenly. 2. Heat 1 teaspoon of the oil in a medium frying pan set on a medium heat. Add the tomatoes, beans, pepper, celery, chilli and coriander. Stir continuously for 7 to 10 minutes, until the pepper is soft. 3. Heat the remaining teaspoon of oil in a separate non-stick frying pan set over a high heat. Fry your egg to your liking. 4. Add the tomato and bean salsa to a warm plate. Top with the fried egg and serve the bacon alongside. Garnish with a few leaves of fresh coriander and serve hot.